This Sunday's Washington Post Magazine cover story was written by Dave McKenna, and it is about sports. The fact that McKenna wrote a story about sports isn't momentous, he does that all the time, but as Poynter's Andrew Beaujon reminds us, this is the first time he's been allowed to write about sports for the Washington Post since thin-skinned ninny Tony Kornheiser ran him off the section's pages 14 years ago. In 1998, [McKenna] made a glancing reference to [then Washington Post columnist Tony] Kornheiser in his City Paper column. Mr. McKenna subsequently encountered Mr. Kornheiser at the holiday party for the Post's sports department. "He jumped up from his table, and said, 'We got to talk,' " Mr. McKenna recounted. "I thought he was joking because I had always thought he was this funny guy on the radio. But he took me in the hallway and said, 'You will never work for a real newspaper' and then he opens his jacket and pulls out a copy of the column that had all this magic marker on it and writing in the margins." "My jaw just dropped," Mr. McKenna continued. "His face turned orange while he was yelling at me and I thought, 'Wait till my friends hear about this.' This really famous funny guy seemed like he was going crazy." 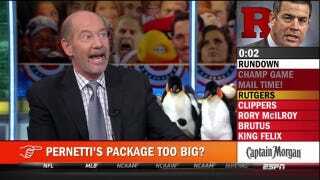 But Mr. Kornheiser was serious. The next time Mr. McKenna wrote about Mr. Kornheiser was in 2000, upon the retirement of local sports talker Ken Beatrice, an event that was covered with a great deal of hagiography in The Washington Post. But Mr. McKenna noted that back in 1981, Mr. Kornheiser, then a reporter, had written a savage takedown of Mr. Beatrice, causing him a considerable amount of personal pain. Mr. McKenna was summoned to the office of George Solomon, then the assistant managing editor for sports, and told he was through working for The Post. "He was very nice about it, but said he had a department to run," Mr. McKenna said. Here's McKenna's story from this Sunday's edition of the magazine. You should read it.